"Great location closed to Myeongdong street, fine for just st..."
Have a question for Stay7 Hostel Myeongdong? "Highly recommend all travelers to stay this lovely place." "Good location for shopping , restaurant and subway." 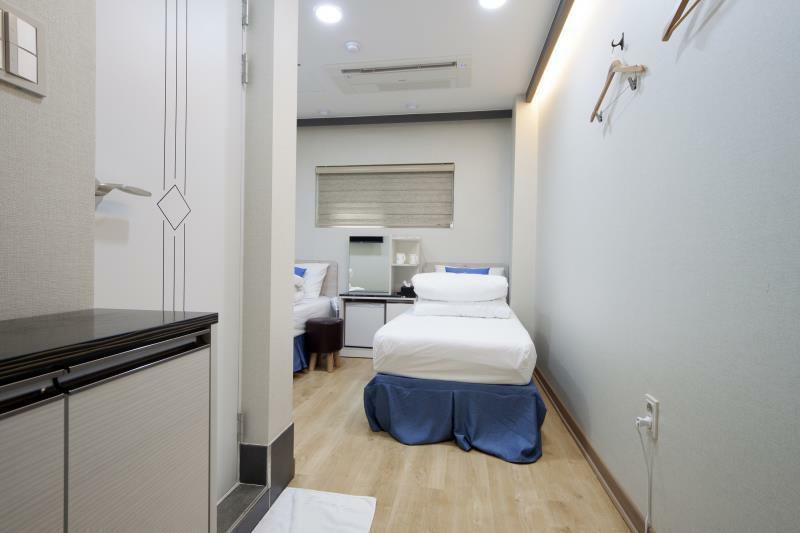 For travelers who want to take in the sights and sounds of Seoul, K-Guesthouse Myeongdong 3 is the perfect choice. Only 0.1km from the city center, the hotel's strategic location ensures that guests can quickly and easily reach many local points of interest. With its convenient location, the hotel offers easy access to the city's must-see destinations. 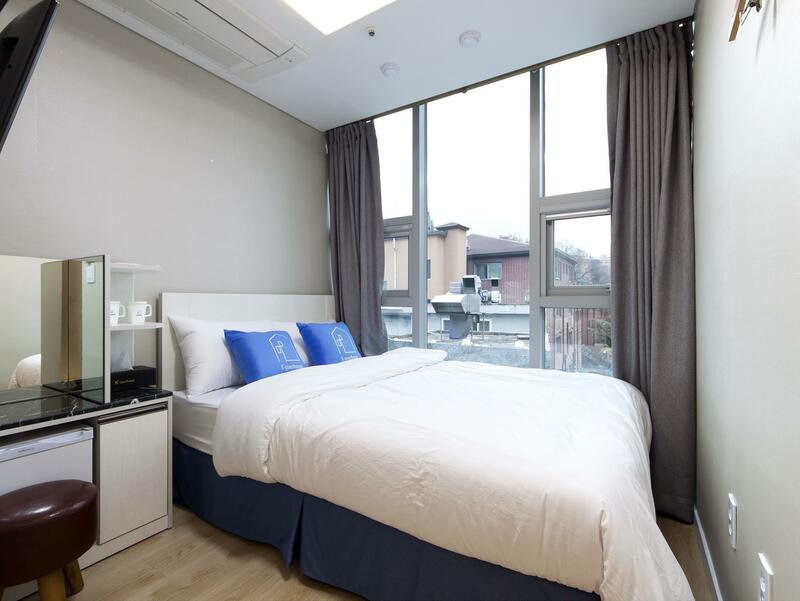 Offering hotel guests superior services and a broad range of amenities, K-Guesthouse Myeongdong 3 is committed to ensuring that your stay is as comfortable as possible. Guests of the hotel can enjoy on-site features like free Wi-Fi in all rooms, laundromat, taxi service, ticket service, wheelchair accessible. The hotel features 34 beautifully appointed guest rooms, many of which include television LCD/plasma screen, clothes rack, linens, mirror, slippers. Besides, the hotel's host of recreational offerings ensures you have plenty to do during your stay. Superb facilities and an excellent location make the K-Guesthouse Myeongdong 3 the perfect base from which to enjoy your stay in Seoul. the room is so small as the price is cheap compares to other korean hotels. the location is nice since it's close to the metro station. it's a quite hotel and just a few minutes walking you will hit the bustling parts of myeongdong. nice hotel though. Hello~ Thank you for staying at K-guesthouse Myeongdong3. Thanks for your review! Overall the guesthouse are ok except 1 of our room is very small and the last day the water heater not working. We was afraid after reading few negative reviews before but however it is acceptable. For eg, negative review about location at back alley is actually good for me due to away from noise at Myeongdong street and its not very dark at all. Location has always been on top of my list that's why I always book this hotel every stay in Seoul. Room is quite clamped but given that this is in Seoul, the room size is no issue. All I need is a comfy bed to sleep on and a bathroom and toilet. Would I stay again? Yes! Would I recommend to other travelers? Yes! Thank you for staying at K-guesthouse Myeongdong3. And we are so happy that you love here. See you ! Stayed here 2nd time. This time in the triple room for 4 nights and surely give lots of reviews for all the upcoming guests to decide. Location is more than perfect. It's right in the heart of Myeong-dong but not that noisy. Room was cozy, bed mattress was comfy but cleanliness weaken my love to this place. I found some insects in room and room was dusty on the window corners. The worst part of my stay is the water heater. It did not work in my last night stay and when I went down to the reception, it was closed at 11 PM ! so no one had no idea what was happening with the water so I gotta shower with the freaking cold water that night. PLEASE PLEASE improve this horrible problem immediately ! because I believe there are many people would like to stay here and if you would like to earn more money, please develop your facilities. However, a male staff I met in every early morning was super friendly, helpful and able to deliver good English. Excellent location - near many shops, restaurants and Myeongdong food street! The room is quite small, though. For breakfast, just like other guesthouses and hostels, you have to make your own - they offer eggs which you can fry, bread you may toast, as well as coffee and juice. You also have to wash the dishes you used. Important thing to note is that their reception is not open 24 hours so you cannot check in in the middle of the night or very early in the morning. When we left the property one day, we saw guests waiting for the reception to open so that they can check in and leave their bags. Thank you for choosing us.And we are so happy that you have a nice trip in Seoul! Thank you again and see you next time! It is quite hard to find the hotel, however the staff are good and very friendly. Thank you for staying at K-guesthouse Myeongdong3. Thank you for staying at K-guesthouse Myeongdong3. We are so happy that you like our guesthouse. See you next time. The room was okay. The bathroom kinda weird. They only gave small towels. provide shampoo and soap but not toothbrush. They only clean your room if you stay more than 3 nights. The location is hard to rate. It’s near to station and once you step out, you can find anything, but it’s in a dark alley which many ppl smoke and trash was collected there at night time. The bed shifted to one side. The wall has lots of stains. They gave slippers but it’s not new. The one i got is very dirty. But the room itself was clean. The staff were helpful and speak english well. They said they offer breakfast but didn’t try it at all. Overall, it’s an okay place if you only need to sleep and bath. 3 mins walk to Myeongdong subway exit 8 and Airport shuttle bus station. Only concern is the safety of guest. As the room is only secure with the sensor lock but no added security lock in the room. Hope they can enhance this else it is not recommended for solo traveller especially female. Thank you for choosing us. You can rest assured about the safety of the guesthouse.And We will strengthen this aspect. Thanks again. We enjoyed our stay because of the location, very convenient, near to airport bus and near to all establishments. The down side is the room is very small, like we cannot open 2 bags at the same time plus we have a toddler which i think he cant even walk inside the room. But overall if you are considering the location, this is a gem!! Thank you for choosing us. We are honored that our service has been recognized by you. See you next time. Thanks a lot. K-Guesthouse Myeongdong 3 is located in the heart of Myeongdong, so the location is very strategic and convenient. A walking distance from the subway, and you'll get to walk past the multitude of street vendors, beauty stores and restaurants. Very easy to locate! The staffs are all friendly. The room is a bit small, but we only sleep in it so we care less as long as the beds are comfy. The breakfast is self-service, you need to cook your own food and wash the utensils. The towels are small though, it's like a hair towel only. So we brought our own since I was able to read in the comments about this concern. Nonetheless, our stay was okay! Coffee shop at the bottom is great! We'll definitely book this again when we return to Korea for another vacation. Thumbs up! Thank you for choosing us. We are honored that our service has been recognized by you. For your suggestions, we will try our best to improve. See you next time. Room is very small but price is reasonable for room located at Seoul myeong dong, the guesthouse not really located at ideal location because it located at the backstreet, quite scary during night time if want to back and forth to the guesthouse. The cleaning service only per request and there is charges apply, they only free 1 time cleaning if stay 3N and above, founds insects in the room. The location is great. It's literally in the heart of myeongdong and a few meters away from the station. You can also do your laundry, although they don't have dryers, so you have to hang your clothes. We stayed in this hotel around winter season. The room we got had a huge window (I think it's supposed to be a veranda) and it made the room really cold. The AC was not enough to keep the room temperature bearable. Every night, I would wake up freezing or I need to sleep with jacket on to warm up. Me and my wife decided to move hotels because of that. Shame, this was recommended by our good friend. Thank you for choosing us. I am sorry to have brought you a bad experience. For your suggestions, we will try our best to improve. See you next time. Great location guesthouse, just couple step to Myeongdong Shopping area and near airport bus and subway station. con is we only can use pantry until 10 while for vegetarian like me need to cook food because hard to find veggie food at korea. Thank you for choosing us. I was very honored to spend a pleasant time with you in Seoul. For your suggestions,We will try our best to improve. See you next time. Thank you for choosing us. I am very pleased that you have spend a pleasant time in Seoul. For your suggestions,We will try our best to improve. See you next time. room is small but in very strategic area of myeongdong. subway and airport bus is just at nearby of the hotel. cons are no cleaning service like Japan,we can put towels in front door. owner will put clean towel to us back. this hotel need to exchange at counter, sometimes in cold weather and after tired journey, really not so conv for us to go down to change towels. towels given is just size of face towel.